How is onshore gas extracted? How are CSG impacts predicted? What is shale gas in Australia? Coal seam gas (CSG), also known as coal bed methane, is a form of natural gas typically extracted from coal seams at depths of 300-1,000 metres. CSG is a mixture of a number of gases, but is mostly made up of methane (generally 95-97 per cent pure methane). It is typically attached by adsorption to the coal matrix, and is held in the coal by the pressure of formation water in the coal cleats and fractures. The different forms of natural gas are generally categorised into conventional and unconventional gas. The difference between conventional and unconventional gas is the geology of the reservoirs from which they are produced. Conventional gas is obtained from reservoirs that largely consist of porous sandstone formations capped by impermeable rock, with the gas trapped by buoyancy. The gas can often move to the surface through the gas wells without the need to pump. Unconventional gas is generally produced from complex geological systems that prevent or significantly limit the migration of gas and require innovative technological solutions for extraction. There are several types of unconventional gas such as CSG, shale gas and tight gas, which are outlined below. CSG is entirely adsorbed into the coal matrix. Movement of CSG to the surface through gas wells normally requires extraction of formation water from the coal cleats and fractures. 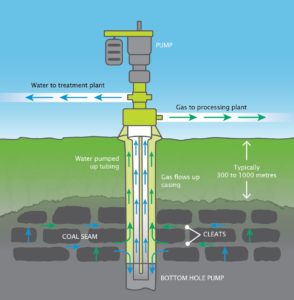 This reduces the pressure, allowing methane to be released from the coal matrix. Over time, water production decreases and gas production increases. CSG production normally requires a higher density of wells than conventional gas production, but CSG wells are typically shallower than conventional wells and cost much less to drill. Shale gas is generally extracted from a clay-rich sedimentary rock, which has naturally low permeability. The gas it contains is either adsorbed or in a free state in the pores of the rock. [Note: the US documentary ‘Gasland’ refers to coal and shale gas; there are important differences between the two in terms of the geological location and characteristics of the reservoirs they are found in, and the processes employed to extract them]. Tight gas is trapped in reservoirs characterised by very low porosity and permeability. The rock pores that contain the gas are minuscule, and the interconnections between them are so limited that the gas can only migrate through it with great difficulty. Why use natural gas as an energy source? Australia has abundant resources of natural gas. Regulation of onshore gas operations is undertaken by relevant state and environmental authorities. These authorities establish regulatory frameworks based on the evaluation of potential environmental risks and hazards of proposed developments. Applying comprehensive science can give insights into the likely risks and impacts associated with individual onshore gas operations. Characterising CSG sites for production and drilling wells is important in assessing the potential of CSG production. Technologies such as three‐dimensional geophysical surveying techniques, mathematical based modelling and imaging of underground reservoirs can be used to observe subsurface aquifers and geological strata, determine how coal seams are connected to aquifers and assess the potential for groundwater contamination. Groundwater modelling can assist in indicating the extent to which coal seams are connected to aquifers, and to predict whether drawing water from one can impact levels in the other. Seismic mapping technologies can be used to map fracture locations and channels for water movement underground. Although absolute guarantees about potential impacts are not possible, existing knowledge from research on aquifers and groundwater models make it possible to estimate the risks and uncertainties of adverse impacts. What monitoring and management procedures are used to assess the suitability of a site for onshore gas operations? A number of detailed evaluation tests and analyses can be used to help determine the suitability of a site for drilling and extraction of onshore gas. analysis of groundwater samples – to determine the existing water quality levels at the site before onshore gas production, and to use as a baseline to monitor any changes during and after production. Information gathered from all the analyses and geological characterisations can be used to build computer models of the site. These models can then be used to make predictions of the impacts of onshore gas production and groundwater systems. Wells may be typically sunk to depths of 300-1000 metres below the surface. They are often laid out on a grid separated by about 750 metres, connected by a network of roads, pipelines and compressor stations. The surface footprint of onshore gas infrastructure is generally less intensive than other industries such as mining. However, the distribution of developments may fragment local habitat and agricultural landscapes and may compromise the scenic and aural quality of the landscape.